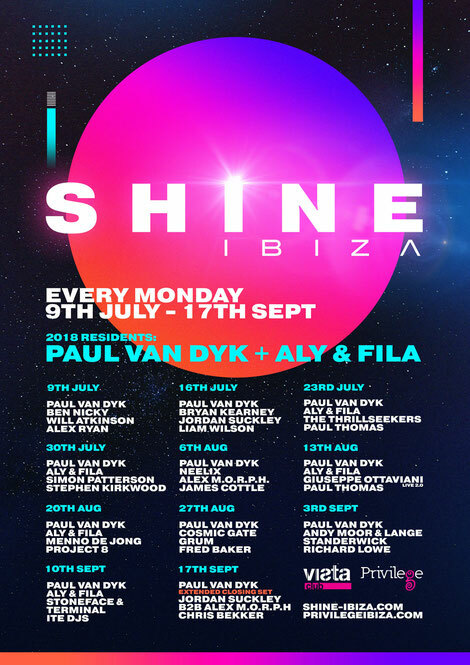 Paul van Dyk, Aly & Fila and more than 20 DJs will perform at Shine Ibiza with an 11-week run that kicks off on Monday 9 July to 17 September at Privilege’s Vista Club with a night that aims to be the centre stage for trance on the White Isle this summer. Completing its line-ups throughout the season will be Bryan Kearney, Simon Patterson, Cosmic Gate, Neelix, Grum, Ben Nicky and others. Vista is the club within a club. By night its glass pyramid structure is a place to dance and as dawn breaks, Club Vista irradiates to reveal a panorama with an outlook across La Isla Blanca that stretches right the way to Dalt Vila.